The new layout is designed with the idea that the average visitor is unfamiliar with CO2 technology and needs to find information quickly. We have made it easy by improving the main menu bar at the top of the screen. 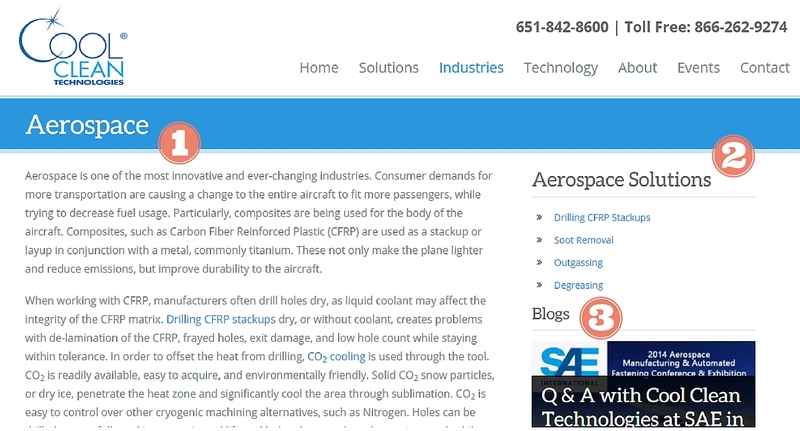 Specifically introducing the “Solutions” tab, where you can find all of the complex applications where CO2 technology is being used over traditional processes. Visitors can see the extensive capabilities of this technology and use that knowledge to discover a solution to their problem. 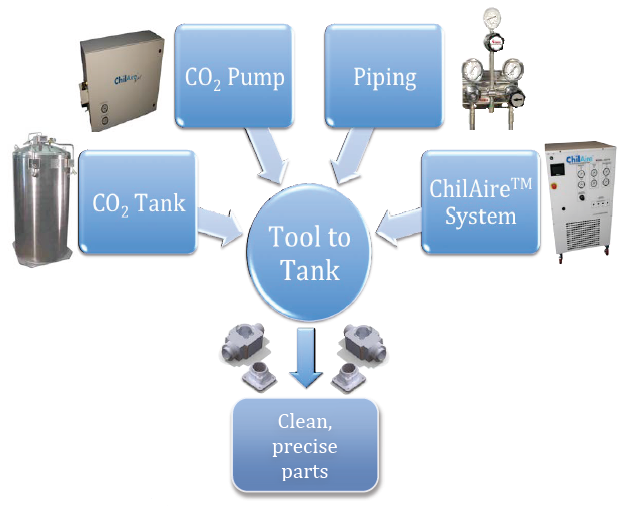 Starting from top to bottom, the solutions are organized specifically to match the CO2 technology (pictured right). 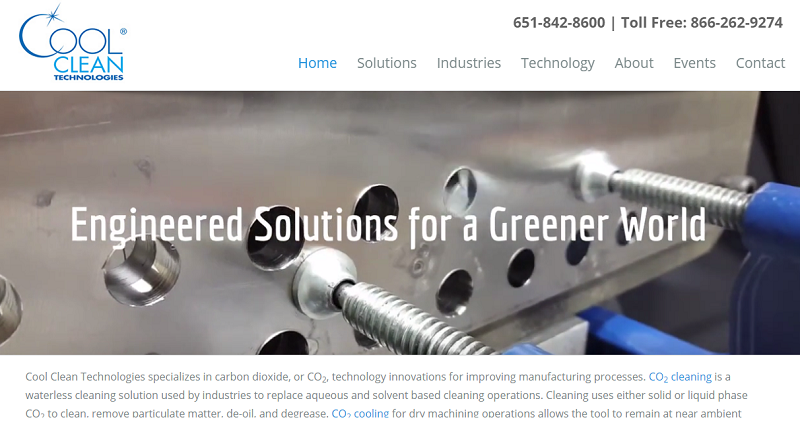 On top, we have the CO2 cleaning applications; surface preparation, particle removal, soot removal, residue removal, degreasing, pre-inspection cleaning, and sintered metal cleaning. These are done using technology for CO2 spray cleaning and liquid CO2 cleaning. As you continue down the list of solutions, you move into the machining portion; drilling CFRP stackups, dry machining, and plastic deburring. 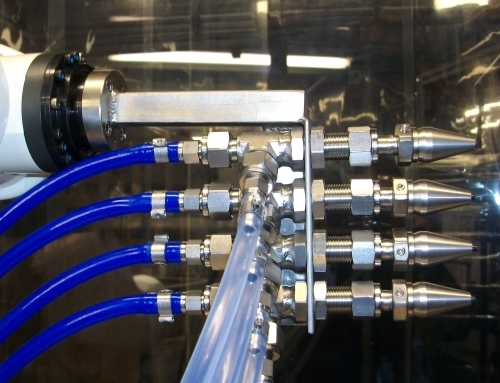 CO2 cooling technology for external and through tool applications is a dry solution over messy coolants and has helped increase tool life. Lastly, the bottom solutions on the list deal with CO2 extraction. Done in both supercritical and dense phase, CO2 technology is seen in botanical oil extraction, silicone extraction, elastomer outgassing, and dry cleaning. As we further understand our capabilities, we will continue to update this list with new information. By clicking on one of the solutions mentioned in this list, you open a specific page filled with information readily available to the application. It is important for this page to display context in a clean format with the most relevant information. From this page, the visitor will be able to understand how the technology will benefit their application. 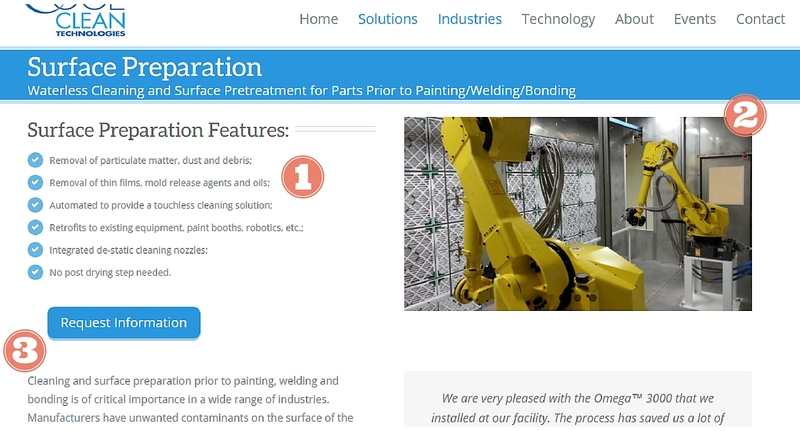 List of Features – This list explains how we stand out from conventional or traditional methods. 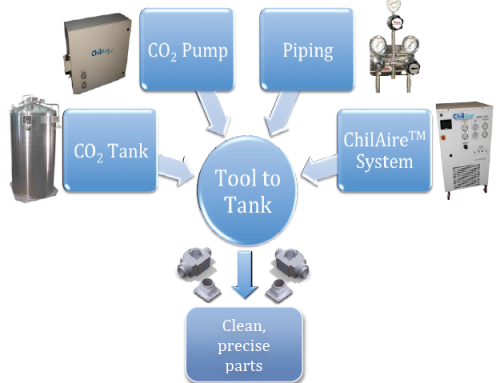 Explains the unique features and benefits by introducing CO2 technology into the specific application. Scrolling Image Box – We feature relevant pictures and available videos to show equipment, process, and products for the solution. Main Content – A comprehensive paragraph further explains the solution at hand. Includes outbound links, testimonials, and PDF’s where available. The industries tab is for measuring the effect of CO2 as it relates to the specific industries. CO2 being a waterless cleaning solution is turning the industry upside down. More manufacturers are seeing water waste as a huge concern. 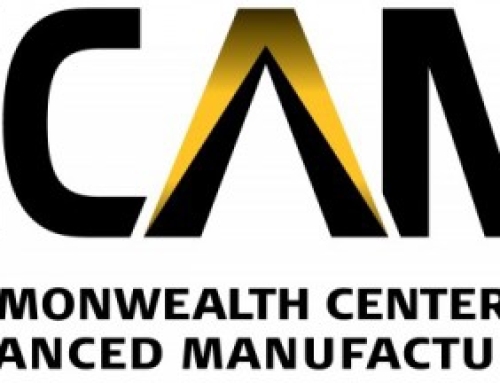 The industries we target include automotive, aerospace, medical, electronics/HDD, optics & display, garment, and jewelry industry. Main Body – The left side of the page is for the content, which generalizes the industry and explains the link between CO2 technology as a solution. Inside the content there are links to inbound pages to further browse through the detailed solutions and technology. Solutions List – The right side of the page is reserved for getting information to the reader quickly. Once you have selected the industry you want to learn more about, we list the various solutions specific to that industry to help narrow down the search. Blogs – Taking your curiosity one step further is to review the different blogs we have posted related to the different industries. Here we share experiences, data, white papers, etc. specific to the work done in the particular industry. 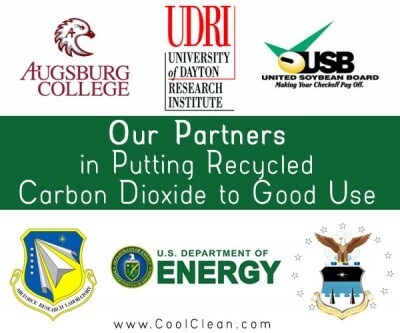 Overall the changes to the website are to serve the purpose of educating the many various solutions and industries where CO2 is making a positive impact. The public paints CO2 as a negative global warming gas, but in reality most of the high energy systems and wasteful processes in place are damaging the environment even more. 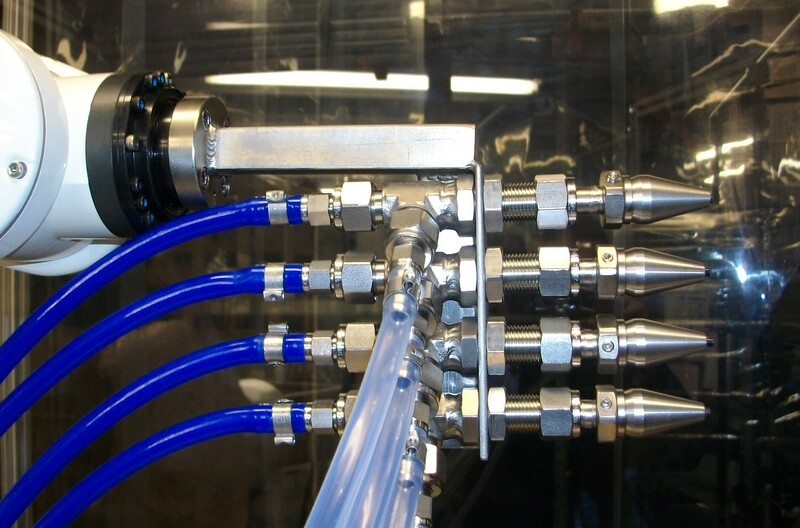 Implementing a solution using our patented CO2 technology can remove these harmful, traditional processes and help your operation become Dry, Green, and Clean.